France has fallen. England stands alone against the might of a triumphant Germany, defended only by the Spitfire and Hurricane squadrons of the Royal Air Force. 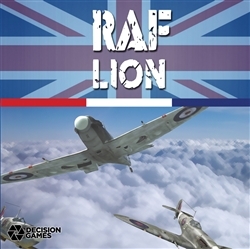 Hitler orders his mighty Luftwaffe to destroy the RAF in preparation for Operation Sealion—the invasion of England. German fighters and bombers fill the English skies and the RAF responds. Now you command the RAF or the Luftwaffe in history’s greatest air campaign—the Battle of Britain. Improving on his award winning solitaire classic, designer John Butterfield ramps up the historical accuracy, tension and play options in this game. 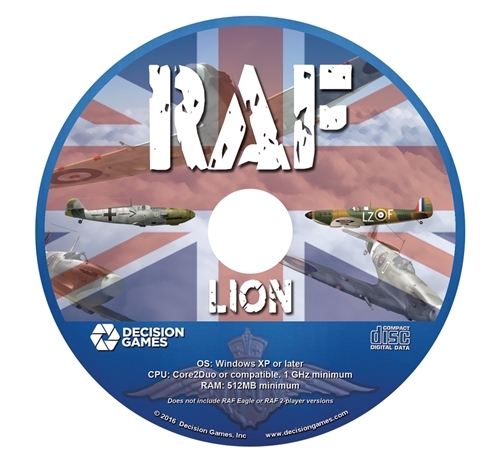 RAF: Lion puts you in control of British Fighter Command, responding to German raids. The game’s unique card system generates targets and forces, which may remain hidden until after you commit your squadrons. Your foe is no mindless system: the Luftwaffe has priorities and a strategy. Scenarios range from one raid day, taking an hour to complete, to the full campaign, playable in 12 hours. Patch is also required for damage radar stations. Radar station 7 was hit with light damage but game played as if station 6 had been hit for the remainder of the day. Game needs some serious patching. RAF doesn't get VP credit for end of days when weather is bad.